Xarelto (rivaroxaban) is a new blood-thinning medication. It was approved in July 2011. There are already serious problems with Zarelto that are being raised by researchers, doctors, and yes, plaintiffs’ lawyers. This page summarizes these issues. If you have a potential claim, call us today at 800-553-8082 or get a free on-line consultation. You can also get a 2015 Xarelto lawsuit update here. Xarelto (rivaroxaban) is an anticoagulant (blood thinner) manufactured by Bayer, marketed by Janssen Pharmaceutica in the United States, which targets blood clotting Factor Xa, interrupting the blood clotting cascade. Other blood thinners that target Factor Xa include apixaban and edoxaban. The US FDA approved Xarelto in July 2011 for the prevention of deep vein thrombosis (DVT) in adults undergoing knee or hip replacement surgery. In November 2011, the FDA approved Xarelto for reducing the risk of stroke in patients with non-valvular atrial fibrillation. Atrial fibrillation (AF) is the most common cardiac arrhythmia and has an increased risk of thromboembolic complications and stroke. 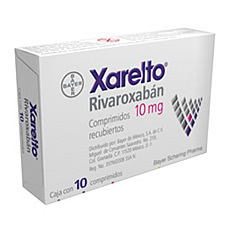 Xarelto’s purpose is to prevent strokes in people with atrial fibrillation. But real questions are lurking about whether Xarelto is safe or effective. There is some evidence – again, some evidence – that people with acute illnesses using Xarelto are twice as likely to develop a blood clot. If a drug bombs out quickly, it is hard not to question exactly what the manufacturer – in this case, Bayer – did to test the safety and efficacy of the drug and, invariably, makes you question whether the company played it straight in obtaining and interpreting the test results that it obtained. Bayer was jazzed to get Xarelto into the $20 billion market of blood thinning products which has long been the stomping ground of Warfarin. Boehringer Ingelheim was also eager to jump in with Pradaxa (which is having its own problems). Warfarin is the most commonly used blood thinning medication on the market and has dominated the stroke-prevention market. It is relatively inexpensive but requires frequent monitoring through INR testing to adjust dosage. Further, it interacts with many foods. Pradaxa and Xarelto were intended to make taking blood thinners and little easier for patients. A noble goal, to be sure. But you first have to make sure any new drug is safe and effective. A clinical study, Rocket AF, was undertaken to compare the safety and efficacy of Xarelto with Warfarin (Coumadin), another blood thinner in over 14,000 patients with Atrial Fibrillation. Xarelto was found to have similar efficacy to Warfarin on stroke prevention. The most common side effect was bleeding, which in some rare cases can lead to death. Results of this trial demonstrated that the risk of bleeding was similar to Warfarin, however, the location of bleeding was different. More subjects had bleeding into the stomach and intestines, whereas warfarin had more incidents of bleeding into the brain. An increase in the risk of stroke was seen in the Rocket study in patients in the Xarelto arm which occurred during the transition from the blinded study drug to open label warfarin at the end of the study. In an FDA advisory committee report, it was noted that Xarelto had reduced efficacy in patients with prior history of stoke/TIA/systemic embolism. Bleeding risks and location of bleeding were confirmed in four studies which included over 12,000 patients undergoing hip or knee replacement. The trial compared Xarelto with Lovenox (Enoxaparin). Number, type, and severity of bleeding events were similar between groups for patients receiving knee replacements, however, in patients receiving hip replacement surgery, Xarelto was associated with a higher number of severe bleeding events (0.3% vs. 0.2%), and was fatal in one case for a subject on Xarelto. The number of bleeding events was also higher in subjects receiving hip replacement surgery on Xarelto compared to those on Enoxaparin (5.8% vs. 5.6%). In the MAGELLAN study, Xarelto and Lovenox (Enoxaparin) were found to be equally effective as an injectable to prevent blood clots over ten days of use. After 35 days of Xarelto use, in comparison to patients receiving Lovenox for ten days and a placebo for 25 days, Xarelto had significantly higher rates of bleeding (4.1% vs. 1.7%). Some results of these studies have come into question after both an FDA advisory committee and a US consumer group Public Citizen stated that some of the comparisons made between treatments were performed in a manner favoring Xarelto. In May 2013, the Institute for Safe Medicines Practices, reported that the number of for Xarelto had overtaken Pradaxa which settled similar cases for $650 million. Things are not getting better and the evidence is getting stronger. Another risk that has been seen with the use of Xarelto is epidural or spinal hematomas in patients undergoing spinal puncture or receiving neuraxial anesthesia resulting in partial or permanent paralysis. There have also been post-marketing cases of anaphylaxis in patients using Xarelto to reduce the risk of deep vein thrombosis. The causal relationship is difficult to establish in post-marketing surveillance due to voluntary reporting in an uncertain population size. However, it is important to note other adverse events that have been reported post-approval including agranulocytosis, retroperitoneal hemorrhage, jaundice, cholestasis, cytolytic hepatitis, hypersensitivity, cerebral hemorrhage, and Stevens-Johnson syndrome. On January 9, 2012, Reuters reported that Britain’s National Institute for Health and Clinical Excellence (NICE) asked Bayer to provide more safety data before recommending the drug for use stating that the data provided was not sufficient to determine safety or efficacy of Xarelto. As a result, NICE did not recommend approval. With numerous anticoagulants on the market, with varying mechanisms of action, physicians should assess each patient’s thromboembolic and bleeding risks to select the appropriate agent to provide the best efficacy with least risk to the patient. Will there be a flood of Xarelto lawsuits? Well, there certainly will not be a flood even if there is a Xarelto recall, simply because the product has not been on the market long enough. But clearly, both Xarelto and Pradaxa are getting the attention of plaintiffs’ lawyers. If you think you may have suffered injury that you believe is attributable to using either Xarelto or Pradaxa, call 800-553-8082 or get a free online consultation.